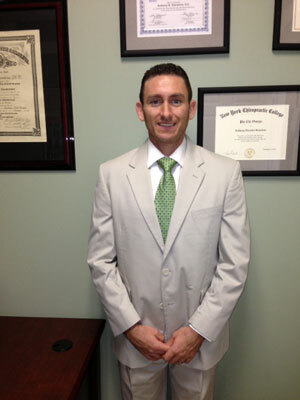 Born and raised in Long Island, NY, Dr. Anthony Giacalone's interest in Chiropractic developed after a car accident left him debilitated. After surgery and numerous pain medications, Dr. Giacalone finally found the answer he was looking for in Chiropractic care. The remarkable results he received as a patient gave him a first-hand appreciation for alternative health care. That appreciation is now the passion that drives Dr. Anthony to help heal and motivate patients in hopes of achieving optimal health. Dr. Anthony received his Bachelor of Science degree from the University of Wisconsin-Madison, and his Doctor of Chiropractic degree from New York Chiropractic College. This didactic education included extensive hours of anatomy, neurology, biochemistry, nutrition, pathology, radiology, and rehabilitation. When he is not treating patients, Dr. Anthony enjoys staying active with his wife and sons participating in sports or enjoying the beaches.